On July 5 from midnorthern latitudes, look west after sunset to see the moon, Saturn, and Mars lined up in the paws of Leo. Mars and Saturn can be easily spotted near bright Regulus prior to this, so start watching now! Two bright planets will approach each other in ourevening sky during the next couple of weeks. They are Mars, which was sobrilliant during the Christmas season of 2007 and has since diminisheddramatically in brightness, and Saturn, which has adorned our evening sky sincemidwinter. Both worlds are now visible about one-third of theway up from the western horizon as darkness falls. 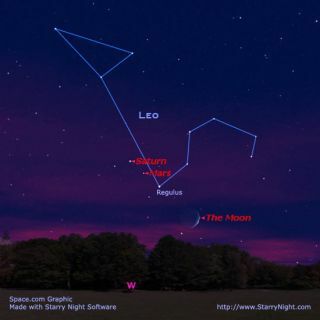 And as a bonus, located between these two planets isthe bright star Regulus, in the constellation of Leo, the Lion. Yellow-white Saturn, shining sedatelyat magnitude +0.4, is located above and to the left of Regulus, while the muchdimmer Mars appears below and to the right of Regulus. At magnitude +1.6, Marshas now fallen to the rank of second magnitude and appears only one-half asbright as Saturn. Regulus, meanwhile is roughly midway in brightness betweenthe two planets. On this scale of brightness, smaller numbers representbrighter objects. If you watch the sky carefully through the next two weeks,you'll be able to take note of the changing positions of these two planets and nearbystar, relative to each other. On the evening of June 30, you'll see Mars just above and to the right ofRegulus, while Saturn sits above and to the left; the trio will resemble anarrowhead that night with Saturn making the arrow's tip. On the evening of July 1, Mars will appear perchedalmost directly above Regulus. The color contrast will be quite striking,especially in binoculars: Mars appears yellow-orange, while Regulus is bluish. On July 5 looking low in the western sky about an hour aftersundown, you'll see a waxing crescent moon, with Regulus, Mars and Saturn alloriented in a straight line in that order, from lower right to upper left. Marswill be situated almost exactly in between Regulus and Saturn. On the followingnight, the moon will have shifted eastward, forming a broad triangle withRegulus and Saturn, while Mars will have moved noticeably closer to Saturn. Saturn, at a mean distance of 886.2 million miles (1.4billion km.) from the sun, takes 29.46 years to move once around the sun. Mars, at a mean distance of 141.6 million miles (227.9 million km.) from the sun,requires only 1.88 Earth-years to complete one journey around the sun. As aresult, Mars' normal eastward motion among the stars is considerably fasterthan that of Saturn. So from our vantage point here on the Earth, Mars willperiodically seem to overtake Saturn in the sky. During the evenings of July 9 through 11, watch how thefaster-moving Mars closely interacts with the much slower Saturn. Despite thedifference in brightness, they still should make for a rather eye-catching pairin the western twilight glow about an hour after sundown. On the 9th, Mars issituated about one degree below Saturn. On the 10th, they are closest together,separated by 0.7 degree; Mars now appears just below and to the left of Saturn.On the 11th, Mars has moved noticeably farther away to Saturn's left. Interestingly, when we combine the motions of Earth, Mars and Saturn, we find that theinterval between conjunctions of Mars and Saturn average about every 2 yearsand 20 days. The last time Mars and Saturn got together was June 17, 2006. Theirnext meeting is set for July 30, 2010.